Carter Jones is astonished early one morning when he finds a real English butler, bowler hat and all, on the doorstep. He announces he is here to stay to help the Jones family, which is a little bit broken. 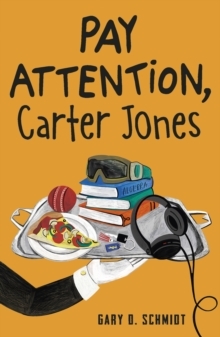 In addition to figuring out middle school, Carter has to adjust to the unwelcome presence of this new know-it-all adult in his life and navigate the butler's notions of decorum and love of cricket. And ultimately, when his burden of grief and anger from the past can no longer be ignored, Carter learns that a burden becomes lighter when it is shared. Sparkling with humour, this insightful and compassionate story is the latest from the award-winning author of Orbiting Jupiter.